Every year I go through the same process: 1) avidly open my Lego Holiday Catalog, 2) plan how to obtain the $37,495 needed to get all the models I want, 3) weep in desperation. But fear not, Lego lovers and lovers of Lego lovers. You don't have to spend a fortune to get some Lego fun this holidays. 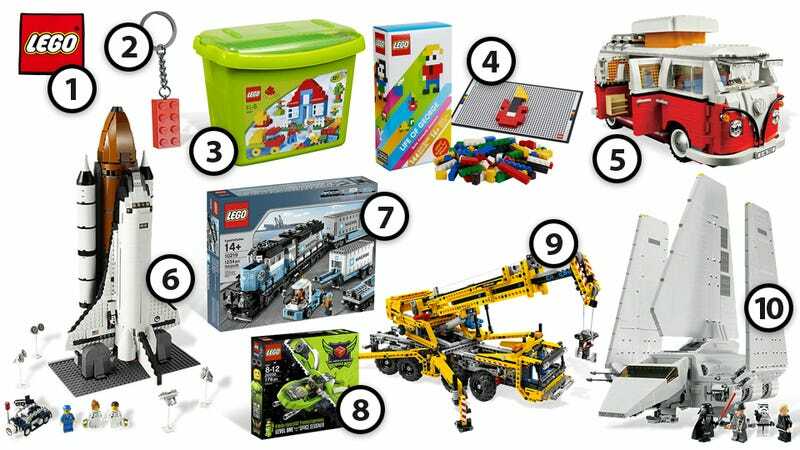 Here's a list of gifts from $2 to $260 that will make you or your gifted one very happy, straight from the 65-foot-high Lego Cathedrals that hold 19 billion pieces a year. And if you don't have a single penny, you can always re-watch our awesome exclusive Lego videos, like How Lego Builds the Minifigs and Inside the Lego Factory. This is my favorite company logo in the world and the only one that is actually on my fridge. Just looking at it invokes the warmest childhood memories and it just looks great. To me, it means happiness, family and injured feet. Now it also means "there's cold pizza and mustard containers behind this door." When my second (ex)wife gave me my marching orders at the Madrid airport, she grabbed my hand, opened it, put my Lego Darth Vader minifig keychain without the London's house keys on it, and said "It's not going to work out" as she turned around to get into airport security never to look back. Lovely drama queen she is. I thought about tossing it away thinking that it would always remind me of the saddest moment of my life, but I ultimately decided to keep it—as a reminder of the saddest of my life and to never repeat the same mistakes again. I'm not including the Volkswagen T1 Camper because it's an intricate model with dozens of amazing details or because of its historic significance as a design icon. Lego. Space. LEGO! SPACE! LEGO IN SPACE! That's enough for me to buy the Lego Shuttle Expedition, even while the 17.5" tall model—with a 10-inch wingspan—is obviously not built to minifig scale. That's an old dream of mine: build a shuttle to minifig scale. It would be huge, yes, probably as big as the giant space shuttle in the 750,000-piece Lego Kennedy Space Center. I'm starting to become obsessed with Lego trains. I was never interested in them until now, which is weird, because I have loved both model trains and Lego since I was a little kid. I even had the Lego Monorail when I was a kid, but then I forgot about how incredible rich and complex the Lego train models are. The Lego Imperial Shuttle is my favorite Lego model of 2011. By far. I can also route my love for it to my childhood, when I built my own Imperial Shuttle at approximately of the same size. Obviously, it didn't look as good. And obviously, I have to deal with my Peter Pan complex.